The posts on this blog tend to fall in a dozen or so categories of things that generally make me happy. Today’s post is so great it fits into 6 of them. A super, awesome big thanks to my friend Janel for making it happen. We met a few years ago at one of the American Library Association conferences. We generally only see each other when we happen to be at the same conference, but keep in touch via ye olde Facebook and Twitter. Janel is a librarian at NPR. 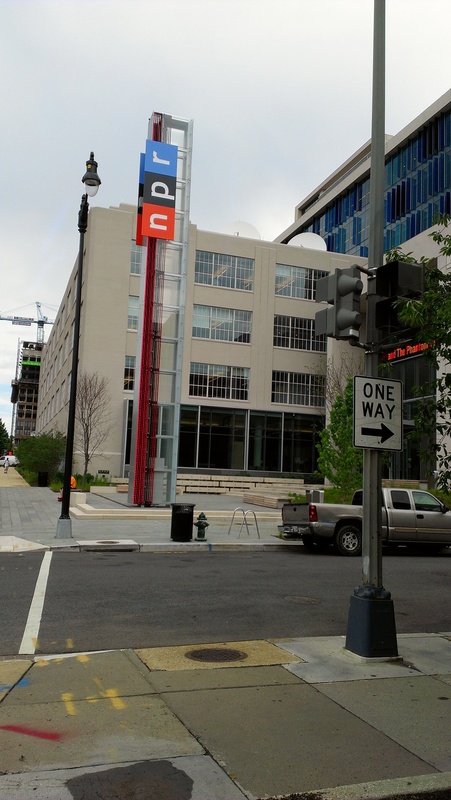 If you pay any attention to NPR then you are probably aware that their Washington, D.C. headquarters recently moved into a new building. Yesterday they had a friends and family open house to show off the building, and Janel kindly invited me down to check it out. As luck would have it I had already planned on taking the day off work to use up some vacation time, so I jumped at the chance. My husband kindly drove me to the train station in Baltimore and I took the commuter train down to DC. The new NPR building is conveniently within walking distance of Union Station, so I didn’t even have to deal with the Metro when I got down there. As part of the open house they had a little tour set up whereby you got a passport that you could get stamped at different areas in the building, which you could then turn in to be entered into a raffle for various prizes. I didn’t wind up taking pictures of much of the building, but there are plenty of photos out there that are professional and better than anything I would take with my phone if you want to see more. One of the things they are touting about the new building is how green it is. They have a green roof. You can see part of it along with some of their satellites in the picture below. If you look closely you can kind of see the mounds, which are where trees are planted on top of the columns in the building. 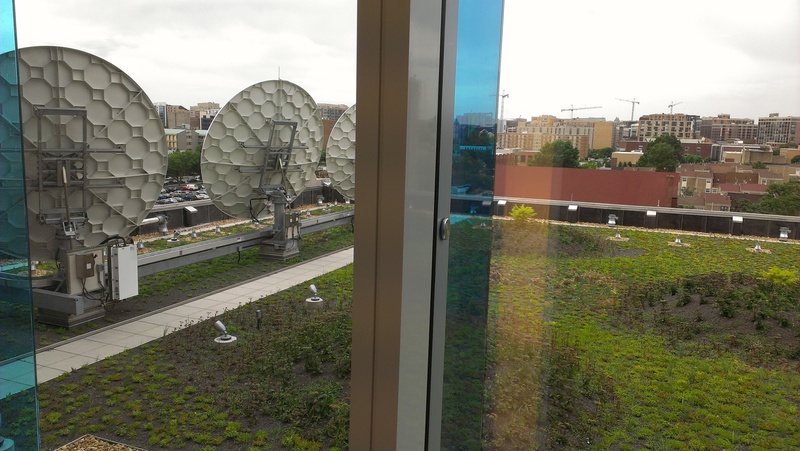 I never thought of trees being planted on green roofs, only plants and grasses, but I guess they do it. I of course did my part to ruin it by accidentally littering on the green roof. We were eating lunch out on the terrace and it was really windy. One of my napkins got away from me and onto a part of the roof that was fenced off so I couldn’t retrieve it. Can’t take me anywhere. They also have a couple of bee hives, which are full of I believe 20,000 bees that will hopefully pollinate the vegetation on the roof. Eventually they will hopefully make some honey as well. NPR honey! 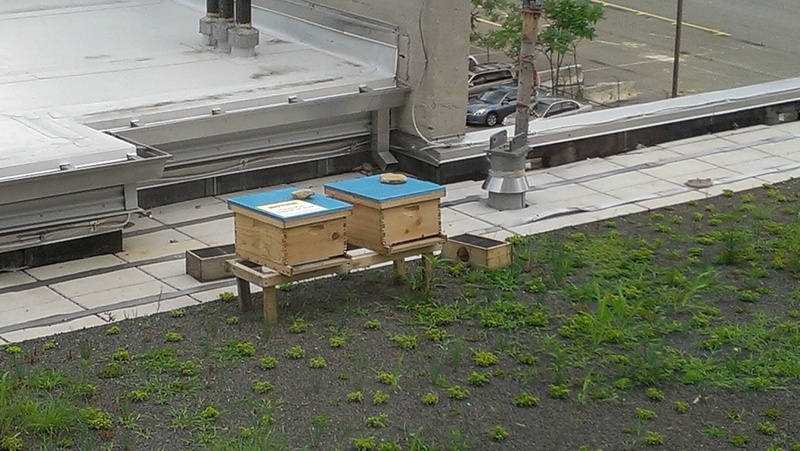 The NPR Bees. You can totally follow them on Twitter at NPRBees. 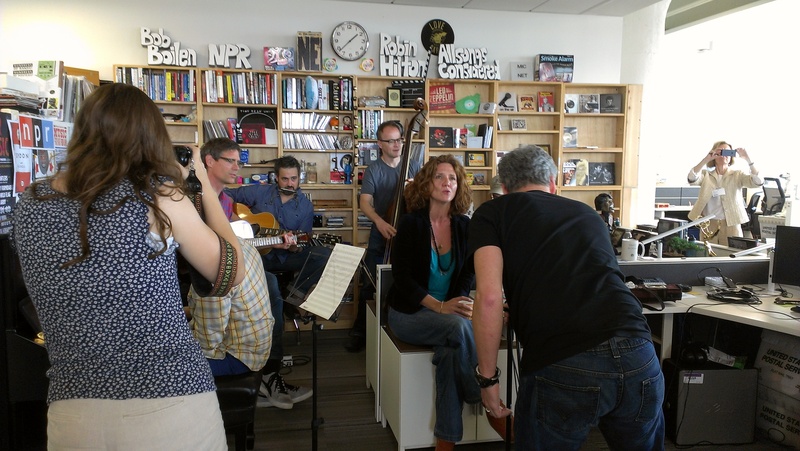 The highlight of the tour for me was getting to attend a Tiny Desk Concert (If you have no idea what I’m talking about see here and here). Obviously if you’ve ever read this blog before you know I love music, and I am a big fan of NPR music in many of its incarnations. The one NPR station I’m a member of is WXPN, which is an NPR music station. (Though I do tell my husband during every pledge drive that we should give some money to WYPR as we listen every morning. We’re stealing our radio!) As such, I of course love the Tiny Desk Concerts. Janel’s desk happens to be right near the Tiny Desk space in the new building. (The librarians’ desks are all spread around the building. I didn’t think to ask why at the time.) She tweeted about it after they moved in, and I jokingly said something about needing to figure out a reason I needed to come hang out at her desk during one. Because she’s awesome Janel took me seriously and look here I am at the Bob Boilen’s desk, aka the Tiny Desk! Proof I was at the Tiny Desk! Although it would have been awesome to see a band I love perform, it turns out that the band booked for the day was a band I had never heard of, the Brooklyn band Hem. I wound up really liking them though, which was even better since part of the joy of Tiny Desk Concerts is discovering new artists to love. It will probably be several weeks before the concert goes live on the site, but I’ll definitely post it here when it does. Hem performs a Tiny Desk Concert. In addition, to getting to tour the building and attending a Tiny Desk Concert it of course was great to be able to catch up with Janel for a few hours since I haven’t seen her in person in about a year. Hopefully we’ll see each other again before another year goes by. My trip home was a little adventurous. I miscalculated how much time I would need to get back to the train. 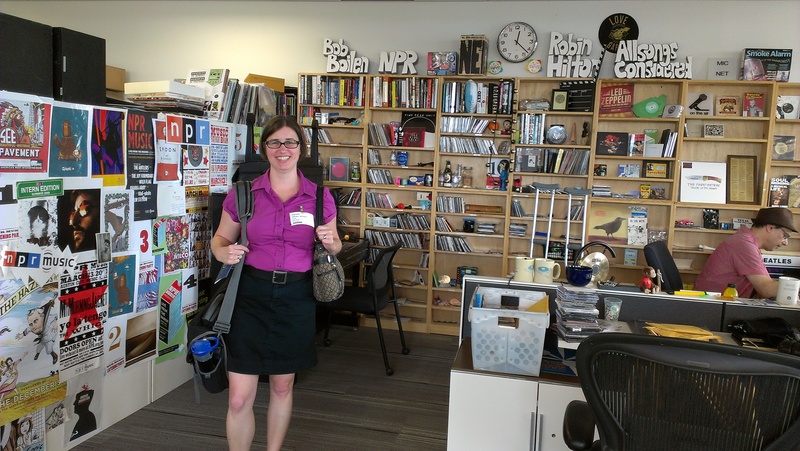 I thought there was no way I would make the 2:20 train home when the Tiny Desk Concert was over so I stayed around to check out the new NPR store in the lobby of the building where you can go buy your NPR swag. Turns out if I had left immediately I would have made it as I missed the train by only 4 minutes. Thus I had to hang out at Union Station for an hour before the next train. That wouldn’t have been a big deal except for the line of severe storms that rolled in right as the 3:30 train was leaving. This would have been an instance where ignorance would have been bliss. The storms themselves never seemed that bad where we were. It was obviously raining hard and we got a little bit of thunder and lightning, but it wasn’t anything I would have thought twice about except for the fact that I was checking Twitter and the entire train ride was nothing but news sources posting tornado warnings for places our train had just rolled through, the scariest one being for BWI airport minutes after we left that station. As I didn’t have a radar to track the storm in conjunction with how the train was moving I had no idea where we were in relation to the tornados or if one was going to break out right by us. Obviously there would have been nowhere to take shelter and being on a train car was not really where I wanted to be in that kind of situation. Thus it was a rather nerve wracking and anxiety inducing ride home. I made it safely though, and I’m glad I got to make the trip down for the afternoon.